Domestic Divas: What inspired you to start Mary’s Gone Crackers? Mary: I had been making my crackers by hand for years, watching everyone love them and devour whatever I made. I woke up one morning and decided that we needed to manufacture them. I developed the crackers out of my need to have something that was gluten free (and healthy and tasty) to have at parties and restaurants. I had been diagnosed with Celiac disease in 1994 and started baking the crackers by 1995. 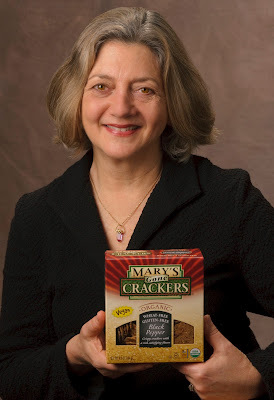 We made the decision to manufacture them in 1999 and by 2004, Mary’s Gone Crackers was born! Domestic Divas: How did you make the transition from baking at home to starting your own business? Mary: It took a long time to learn a lot of things in that 5 year period. Neither my husband nor I were in the food business. He focused on writing a business plan and getting investors while I focused on learning about equipment and figuring out how to make my handmade recipe in a more automated way. By the time we were ready, we both knew a lot about the industry, had found a company to help us get started with the manufacturing. (We ended up taking over production because we weren’t happy with that company’s standards.) It has been a steep learning curve in every way. There has been a lot of hard work and a lot of luck—for example, the more automated version of the crackers turned out to taste better and be more sturdy than my handmade version had been! We really felt like the “universe wanted these crackers” because there was so much serendipity around our company. Domestic Divas: How did you come up with your famous cracker recipe? Mary: I had the idea for the ingredients floating around in my head for a while, but I wasn’t sure what to do with it. When I finally started playing with the dough, it was so sticky and gooey that the only thing that worked was making it into a cracker. I really liked them and just kept making them for myself! They were very labor intensive—the most I could make by hand was 240 crackers in about a 5 hour period. Now we are cranking them out 24 hours a day 5 or more days per week and I don’t have to make them in my kitchen anymore! Domestic Divas: What’s the hardest part about living with Celiac disease? Mary: Having been ill for most of my life (I was 43 when I was finally diagnosed), I’d say that going undiagnosed for so long (40 years), the misinformed or ill-informed medical profession has been the most difficult struggle. Doctors are getting better, but we still have a long way to go. Now that I’ve been gluten free for almost 17 years, the occasional contaminated food, missing some junk food like doughnuts that I’m really better off without anyway, are the only issues. The consciousness out in the world has changed so much that it’s not such a struggle to go out to eat anymore. I’m grateful for having this “limitation” in my diet. It has changed me in so many ways; not only am I healthier having discovered this illness, but I’m making much better decisions about how I eat since my consciousness has been raised. And of course, I’ve made a significant career change as well! Domestic Divas: Which cracker flavor is your favorite? Mary: I rotate, but I’m stuck on Onion crackers and Chipotle Tomato Sticks & Twigs right now.